The battle to be crowned 2018 Sunoco Whelen and 240 Challenge champions intensified further last weekend when a number of potential winners from the Henderson Insurance Brokers LMP3 Cup and Mini Challenge Cooper classes fell out of contention. 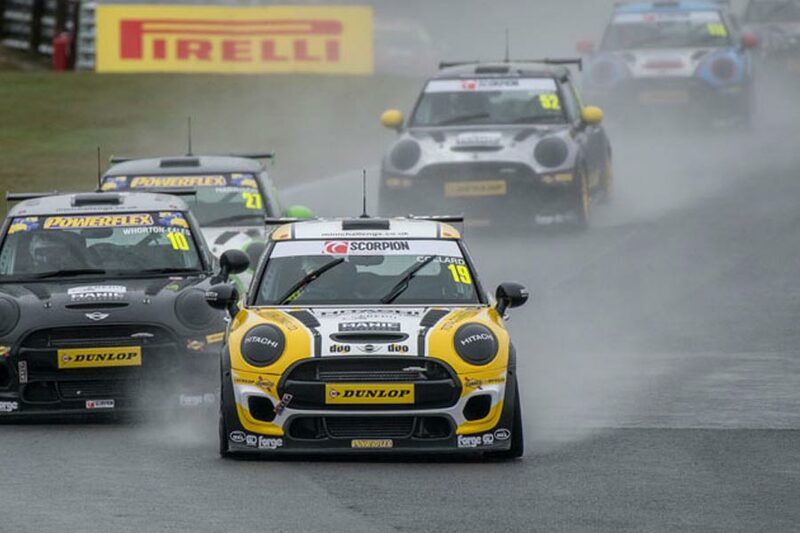 Attention now turns to this weekend’s crucial meeting at Donington Park where British GT and Mini Challenge JCW – two championships with drivers very much in the running to win both Rolex 24 At Daytona prize drives – stage their final rounds of the season. LMP3 Cup rivals Colin Noble Jnr and Matt Bell no longer have a chance of winning this January’s senior Rolex 24 At Daytona prize drive after both failed to score enough points during their Donington Park season finale. With the title already decided in Noble Jnr’s favour, both Pro drivers – neither of whom are eligible to take part in qualifying – were desperate to improve their Sunoco Whelen Challenge chances by winning the championship’s final two races and scoring double points for fastest laps. Bell managed just that in the opener, while contact between himself and Noble Jnr put paid to the Ecurie Ecosse driver’s chances initially. The newly-crowned champion then looked on target to make amends in the wet second race by setting fastest Pro lap before aquaplaning off into the barriers and out of a comfortable lead. Bell came home second to further boost his weekend’s good work. Indeed, such was his haul that the United Autosports driver jumped three places in the standings from seventh to fourth and 0.13 points ahead of Noble Jnr, who slipped from third to fifth. However, Bell’s final total of 68.21 will not be enough to beat current leader Stuart Middleton regardless of where the British GT4 Pro finishes this weekend. His lowest theoretical average score of 68.75 will still be a shade more than Bell’s. Nevertheless, Middleton cannot afford to back off, and certainly not when four other drivers are still in contention to win the coveted fully-paid-for DPi seat at Daytona. He and HHC Motorsport co-driver Will Tregurtha are both chasing the British GT4 title this weekend but will also be keeping one eye on each other’s performances as they battle for Whelen top-spot. Middleton currently holds a 2.45-point advantage, which would be negated if Tregurtha were to set fastest qualifying time or race lap. In the event of a tie Sunoco Challenge organisers will look back through ‘second-best’ personal results to determine a winner. The pair’s only GT4 title rivals also remain in Whelen contention. Alex Reed and David Pittard are currently tied sixth but will need a very good weekend to both steal the British GT title and potentially jump all five drivers ahead of them. The Lanan Racing duo are 8.56 points behind Middleton at present. Meanwhile, Stuart Moseley is now the only driver able to prevent a British GT ace from claiming the Sunoco Whelen Challenge title for the fourth year running. His recent exploits at Silverstone boosted the Radical European Masters SR3 racer’s season average by 3.69 points to leave him 6.45 shy of Middleton. Crucially, though, his potential maximum with six races remaining is far higher than the current leader’s theoretical best – 84.15 vs 97.97 – ensuring that this year’s winner could be decided at the very last Sunoco Challenge-eligible event of the season! There’s no change in the rest of the top-10: Sam Tordoff is best placed of British GT’s eligible GT3 contingent in eighth, Joe Osborne (GT4) is ninth and Jon Barnes (GT3) 10th. Jessica Hawkins missed her chance to maintain the pressure on Rick Parfitt Jnr at the top of the Sunoco 240 Challenge table last weekend, while Mini Challenge Cooper rival Matt Hammond continued his late charge at Donington. Following a strong start to the season Hawkins’ performances have tailed off a little in recent weeks to the point that she has now slipped to third in the standings behind Jon Minshaw, who will be battling fellow GT3 Am Parfitt Jnr for the British GT title and 240 points lead this weekend. Second and fourth places at Donington saw her average score drop to 91.33, 7.67 points off the current lead and just 0.26 ahead of Hammond who again scored strongly thanks to a pair of victories and pole positions. Even a disaster for Parfitt Jnr this weekend would see him end the season on 89.1 points, a very respectable total that will be tough to beat. Minshaw, Hawkins and Hammond all have one final opportunity to do just that, along with Mini Challenge JCW leader Brett Smith who also competes for the final time in 2017 at Donington this weekend. He lies fifth at present, 0.44 points behind Hammond who won’t be back in Cooper action until October 28/29. That same weekend will see the 240 Challenge’s only other potential winner, Jacopo Sebastiani, conclude his F3 Cup campaign at Oulton Park. His maximum average of 91.94 is just enough to beat Parfitt Jnr’s worst-case scenario score. GT Cup GTA driver Dominic Paul is seventh and first of the drivers unable to win this year’s title. LMP3 Cup champion Alasdair McCaig slips to eighth having seen his Sunoco chances go the same way as Ecurie Ecosse co-driver Noble Jnr last weekend, while Shane Kelly and Jack Lang complete the top-10.